The Royal Ontario Museum is about collections. It’s about old stuff. And if you ignore the second floor (with its taxidermy and dinosaurs), then you might be impressed like I am by how “human-centric” the collections are. It’s all about us. What we make, what we use, how we look. It’s like a kind of tagging through the ages. For instance, the glass cases in the Asian galleries contained Buddha and bodhisativas and demons and men of all kinds. Even a few women. And the purpose of the images? To confirm the goodness in us, or to make a mark, a lasting impression? He was there and because of this icon, the future will know him. I’m overwhelmed by this impression in the Greek and Roman galleries. Figure after human figure. Marble heads. We love looking at ourselves. I’m just realizing it. Our purpose seems to be us. We worship the human form (okay, Islamists might not). There’s something about the human image and our drive to capture it. Does a piece of the soul stay with the creation, as some cultures claim? Perhaps it’s time to burn my self-portraits. ROM, Egyptian Pre-dynastic. Two figures found in the mud and reconstructed. they are thought to represent grief. 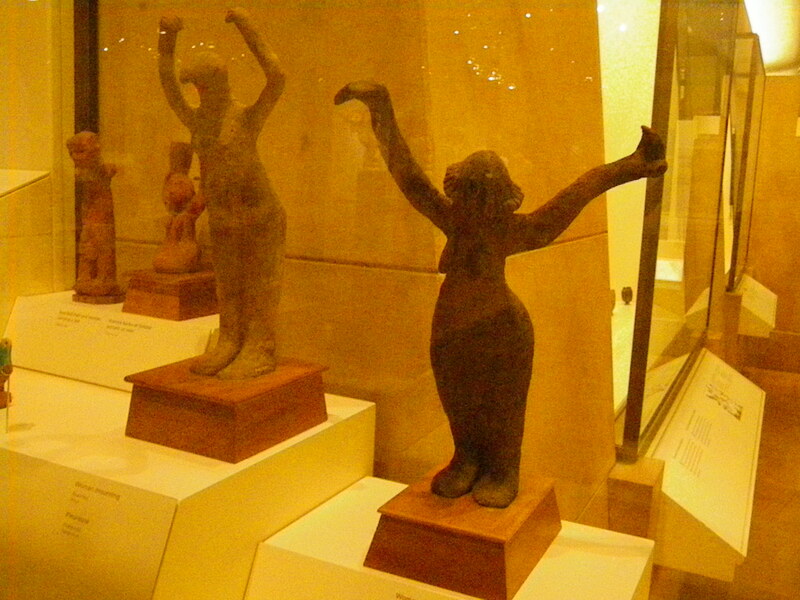 In fact, I found two figures of women, very expressive, in the Egyptian gallery whose souls seemed to still be present. They are dated as pre-dynasty, and were found in the mud of the Nile. I love them for their gestures, so unfathomable after what, 4000 years? It’s all about us. What we collect, the stories we tell, the clothes we make, the tools we use, the we adorn our bodies. We stand as individuals, as votives representing something, something that we in turn, love to look at. I’m wondering what that might be. 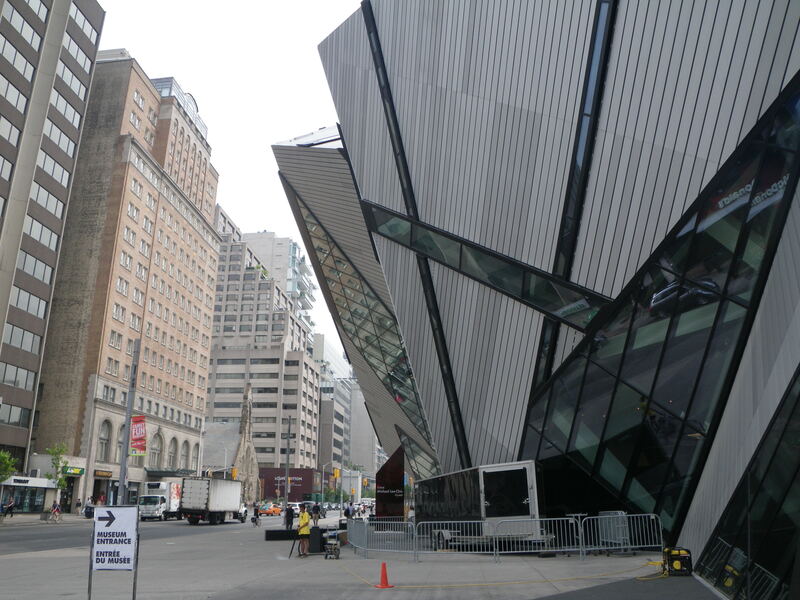 While London is a culturally active city, Toronto has the Art Gallery of Ontario and the Royal Ontario Museum. I find it’s worth taking the train to spend an entire day at either place. The ROM is my target for this visit. The last time I was there, I didn’t sketch much but wandered the endless collections until I felt the vertigo and had to get off the ride. My mission this time has focus. Find the Buddhist boys. 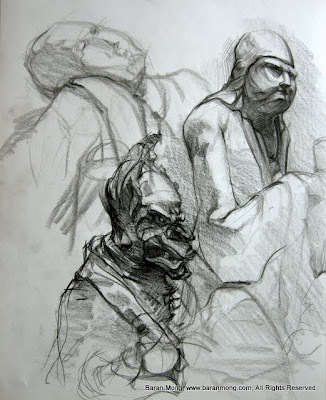 Baran Mong’s sketches from the Royal Ontario Museum, July 2011. In the World Culture Asian galleries, there are a couple of collections of Buddhist statures. whether standing tall or seated with a round belly, they are painted, gilded, jeweled. Then there’s a group of what looks like plain, unembellished limestone monks. Another artist, Baran Mong, has also found the boys and included one among his really spirited sketches. My impression of them from my last trip was that they were very hungry souls, and that the artist had rounded out their faces, which to me, didn’t match the thinness of their bodies beneath the robes. While the statues might have been commissioned as propaganda (I’ll try to find out more), the artist shows an exceptional compassion for his models. Maybe even love. What delights me is that they’re real men, young and quite frankly, thin and not so perfectly spiritual as The Buddha. Imagine your meditation or yoga group carved in stone. Then imagine sitting before the that group, each a singular expression captured in stone, and meditating on that — 500 to a 1000 years later. I’m wondering about potential, about energy explosions and implosions, big bangs and black holes. 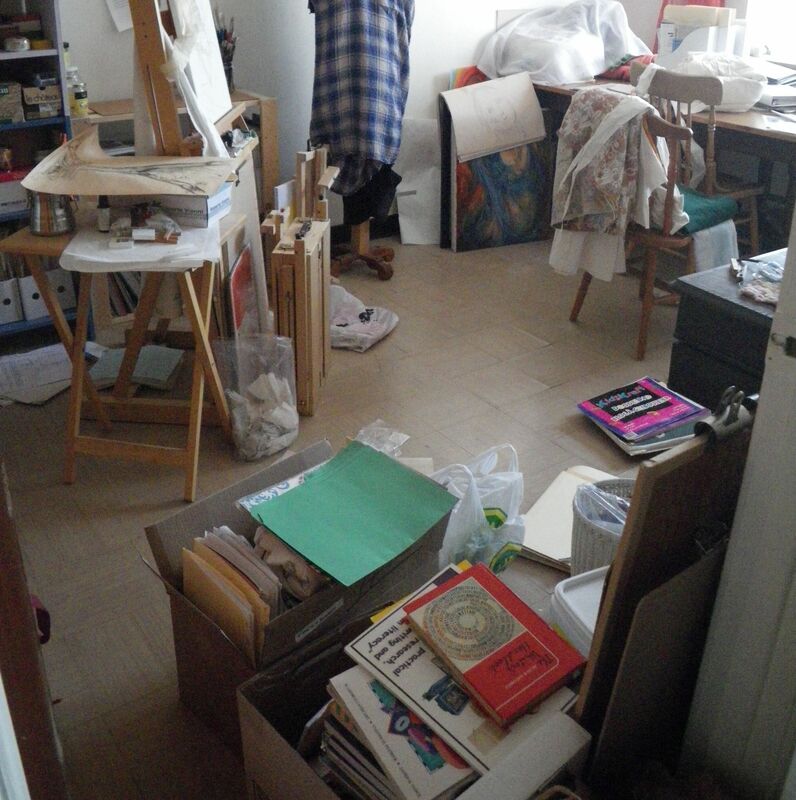 I’m looking about my studio space and at the number of projects that remain visible, that swirl in space. There is a sense of organization into two camps — painting and sewing. The easel and the sewing machine are both accessible. Horizontal surfaces are covered in piles of stuff. Shall we start by naming the planets? I mean, the piles. There are two stacks on the work table. Pushed to back are large quilt squares, protected from dust by a square of old flannel. A block of soapstone sits on top. This pile is not going anywhere even though it’s planned and the materials are gathered. The cutting has started. Why, I ask you, has it sunk into a black hole? The answer lies under the second pile, a twin-star system. It is really two piles covered by one piece of linen sheer drapery fabric. I like the white, semi-transparency of the sheer. It allows the piles to breathe. One doesn’t need a telescope to remember the contents. One star is fabric. More material for the quilt, two pieces of jersey for dresses, and some lovely green wool that I bought fifteen years ago along with the black wool. This pile, I believe has the potential for greatness. It’s waiting for the big bang. Its twin-star also has potential. 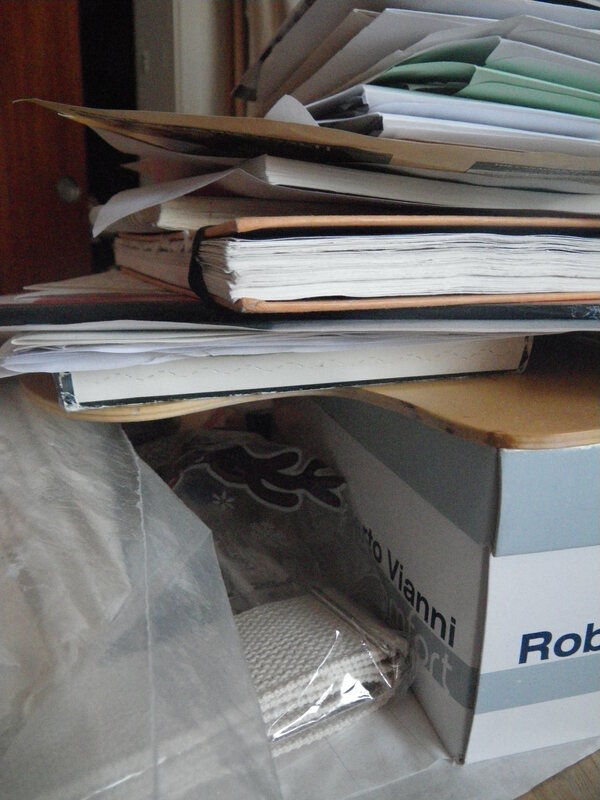 It’s a pile of sketches, files, art-related books, patterns and brown paper pattern blocks. The raw materials of genesis. On the seat of a chair that’s pushed under the table is a rogue planet. More fabric and old clothing (kept, because I like them and wore them to death, for their patterns). It’s hidden potential. A possible colony of retro style. On the floor is a stack of primed canvases that I bought on sale, on speculation. I like to think, that I’ll get out and paint, that I’ll wander the universe and record the wonders. They are prepped with fresh gesso and ready to go. Beneath them is the anti-matter to this painting potential, a box of vintage clothing patterns. A pile of ephemera lies on the small table beside the easel. Paints, a box of drawing tools, brushes, envelopes of past monthly financial receipts, lots of rags, researched information, a how-to guide from a portrait painting class, a jar of solvent, some Christmas toys, a pen and ink drawing from 1982. That’s all I see without moving anything. A virtual asteroid belt, distracting and unstable. I’m not a collector, I swear. I’m an optimist with raw potential piled about the studio. The canvases and fabric, the tools and patterns are ready for the Big Bang. The question is, which universe? And how to chose?